Book your online demo! Start FREEMIUM version of the EcosAgile Customer Relationship Management software with no obligation. Let’s find out the ECOSAGILE CRM potentials and its advantages. Freemium to test first hand why it is unique. Customer Relationship Management or CRM is increasingly becoming a priority for national and international concerns that are focusing their energies and strategies on current and potential customers; on every business opportunity and lead. 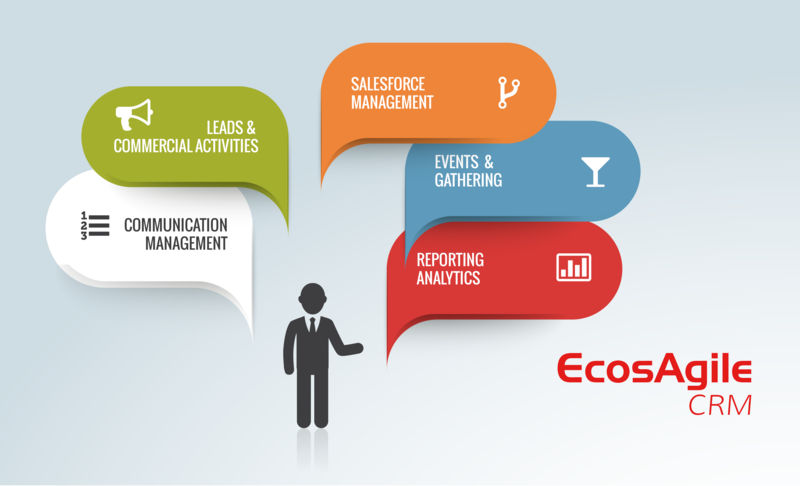 EcosAgile CRM provides perfect supports for these activities, with detailed standalone contact management and/or prospects classified by type, activity, industry, references and markets, with immediate commercial budget management and all the tools needed to process information and help make the right commercial decisions. It is a powerful communication and marketing tool which is both thorough and flexible, supporting the entire company and sales team in their objective: growth and retention of customers and markets. The data can be easily loaded from xls files, and all your information can always be exported at any time with a single click, without any complication. It is seamlessly integrated with all the other products in the EcosAgile suite so it can interact with any other required processes. EcosAgile CRM is a platform for the creation of web-based CRM solutions according to the client's ‘tailored’ requirements; it can help you obtain excellent results in terms of quality and cost thanks to an innovative approach based on its functional layout and the configuration of the processes. It is an extensive solution with a range of standard features that are preconfigured for immediate activation and which cover not only all the core processes, but also correlated activities (External Communication, Knowledge Management, Help Desk, Events/Gatherings, etc.). Unlike other CRM solutions, EcosAgile is able to perfectly adapt to the particular requirements of your business and your processes with ease and with quality and cost levels that our competitors cannot match. Predefined interfaces and a specific configurable integration component allow you to import and export record layouts in any format, avoiding the frequent compatibility problems seen in competing solutions. EcosAgile CRM is designed to function in international companies and/or foreign subsidiaries and allows you to share or separate content across multiple companies/clients that have different functions within the same group and/or between national/business units/departments. EcosAgile CRM is for businesses oriented towards the development of client relations and loyalty where, in business-to-business and business-to-consumer climates, the client is the centre of attention and the focus of corporate strategies.